Hydrogels have several key properties that must be understood both experimentally and theoretically in order to effectively design functional hydrogel-based materials for applications. However, the unique nature of hydrogels as materials (e.g., their high water contents, soft mechanics, internal porosities, networked chemical structures, etc.) makes many of the techniques typically used to assess the properties of other polymeric materials difficult if not impossible to apply to hydrogels. For example, contact angle measurements that are widely used to assess the hydrophilicity of a material interface are ineffective with hydrogels due to the typically rapid absorption of the droplet into the gel phase. Methods used to measure the porosity of hard porous materials (e.g., gas adsorption, mercury porosimetry) are ineffective at assessing the porosity of hydrogels given that hydrogels compress upon pressurization and the water inside hydrogels cannot effectively be displaced without significantly deforming the network structure. Many common techniques used to assess morphology (e.g., electron microscopy) or surface chemistry (e.g., x-ray photoelectron spectroscopy) require operation in a vacuum, posing challenges in the context of analyzing a highly water-swollen material. Furthermore, standard chemical characterization techniques used for polymers (e.g., nuclear magnetic resonance) are challenging or impossible to apply quantitatively to hydrogels based on the crosslinked networked structure which significantly alters relaxation times or other fundamental mechanisms used for chemical analysis. As such, hydrogel characterization is frequently a significant challenge, particularly from a chemical perspective. However, at the same time, the unique properties of hydrogels have led to the development of several techniques beyond those used for conventional “hard” materials that have enabled a significantly better understanding of both the fundamental physics as well as the application performance of hydrogel-based materials. In this chapter, we outline the key properties of hydrogels from the chemical, physical, and (briefly) biological standpoints, describe the conventional methods/approaches for measuring such properties, and outline the key theoretical relationships used to understand the fundamental influencers to those properties (the latter of which are also essential to understand in order to rigorously apply the techniques described). Chemically, there is interest in analyzing both the chemistry of the building blocks incorporated into a hydrogel (particularly when two or more different building blocks are used as the basis of hydrogel formation) as well as the extent of reaction among available crosslinking groups. However, the network structure of hydrogels makes the chemical analysis of hydrogels challenging, as many of the traditional solution-based chemical characterization methods often do not give accurate or consistent results with hydrogel networks. As such, while most of the methods described below are highly imperfect, they can collectively give insight into gel composition and crosslink density. Proton NMR is the most common method used for the chemical characterization of polymers [1, 2]. However, in the context of hydrogels, NMR is challenging due to the significantly extended proton relaxation times observed within hydrated network structures, resulting in peak broadening that effectively reduces signal-noise [1, 2, 3]. In addition, functional groups at the periphery of the hydrogel and in the bulk of the hydrogel are often exposed to functionally different chemical environments (particularly with regard to the balance between free and bound water) and local crosslink densities, resulting in asymmetric signal generation throughout the hydrogel and thus selective over-weighting of functional groups in local areas with faster relaxation times. Reducing the dimension of the hydrogel from the bulk scale to the nanoscale somewhat improves the analysis , but quantitative analysis in the manner of small molecules or linear polymers remains challenging. Solid-state NMR using magic-angle spinning has been applied to address this problem, with some success in particular for tracking changes in crosslinking during the process of gelation . However, signal-to-noise can still be a challenge with solid-state NMR, particularly in probing hydrogels with lower crosslink densities if the main purpose of the analysis is to calculate crosslink density, and experiments are slow and expensive. IR spectroscopy is a useful tool to identify bond types in hydrogels and other polymeric systems. While the conventional potassium bromide (KBr) pellet technique for transmission-based IR can be applied to hydrogels, the difficulty inherent in grinding hydrogels (which remain somewhat wet due to bound water even when “dry”) often makes it difficult to create uniform pellets with substantial transmission . Alternately, attenuated total internal reflectance techniques (AT-FTIR) may be used to probe the surface (0.5–5 μm) of the hydrogel , with the assumption that the surface chemistry is not substantially different from the bulk chemistry. This assumption should however be made with care, as AT-FTIR results are often carelessly interpreted in the literature. Sensitivity and quantification are also challenges in using IR for characterization of hydrogels (or indeed polymers in general). Interpretation of small crosslinker signals in particular should conservatively be limited to the qualitative appearance/disappearance of peaks related to the crosslinking compound before and after reaction. Fluorescent probes that can covalently react exclusively with one or more functional groups on the hydrogel building blocks can be used as an indirect measure of residual functional group content and thus crosslink density, shown in Fig. 1 . This method assumes (1) the probe can effectively diffuse through the hydrogel to bind with all accessible residual functional groups and (2) the effective yield of the reaction between the probe and those residual functional groups is ~100%. On this basis, care must again be taken in interpreting such results as fully quantitative, with the method particularly useful for comparing relative numbers of unreacted functional groups between different hydrogels of similar compositions and/or confirming the uniformity of hydrogels prepared with two or more functional precursor polymers . XPS can identify the elemental composition of hydrogels and, when used in high-resolution mode, can give insight into the types of bonds present in hydrogels based on the subtle differences in binding energy depending on the types of substituents adjacent to the bond being studied . This technique is particularly useful in cases where it is sought to prove a particular type of crosslink has formed, but IR techniques do not give the required resolution. However, as with any XPS measurement, only the surface (~10–50 nm) of the sample is probed ; furthermore, due to the need to operate under a vacuum, the hydrogel must be dried prior to analysis, potentially altering the crosslinking chemistry of particularly dynamically crosslinked hydrogel systems relative to their solution state. Atomic absorption spectroscopy (AAS) may be a better choice in some cases, as it can probe the elemental composition of the entire bulk gel and thus give a clearer picture of overall crosslinking density (particularly if the crosslinker has a distinct element versus the building blocks) and/or monomer incorporation if the comonomers have different C/O/N/H ratios . However, AAS has no capacity to give any information about the bonding between these atoms and, as a result, cannot distinguish between single (graft) or multiple (crosslink) reacted crosslinking molecules. For the design of hydrogels for targeted applications, three key physical measurements are typically performed: (1) hydrogel swelling, associated with thermodynamics and/or changes in the crosslink density within the gel over time; (2) hydrogel mechanics, associated with the viscoelastic properties and/or the load-bearing potential of the networks; and (3) hydrogel morphology as it pertains to the porosity of the gel network (affecting the rate of molecular diffusion in or out of the hydrogel) and/or the capacity for domain formation inside hydrogels (affecting both diffusion and the capacity of the hydrogel to adsorb chemicals in its environment). Swelling in hydrogels is typically reported either as the change in the percentage of water inside the gel network from the initial to the final state or a ratio of gel mass or volume before and after a swelling event (from which the percent water can be calculated if the initial water content of the gel is known). The two most commonly cited swelling ratios (SRs) are relative to the dry state (Eq. 1, representing the mass or volume change related to water adsorption/absorption to the hydrogel when a dry sample is placed in water) or the initial equilibrium swelling state of a prepared hydrogel before its conditions are changed (Eq. 2, representing the change in mass/volume between the initial and new equilibrium condition). Here, X can represent either mass or volume, depending on the type of swelling ratio desired. Alternately, a percent water in the hydrogel can be calculated based on the dry swelling ratio according to Eq. 3. While the equation is written to calculate the percent water, the water fraction can be similarly calculated by not converting the final ratio to a percentage. A % swelling value can also be calculated to express the wet swelling ratio of a hydrogel from its original swollen state (Xinitial) to its new swollen state (Xfinal), as shown in Eq. 4. Note that the % swelling value may be positive (gel swells in new condition) or negative (gel shrinks in new condition) depending on the nature of the swelling response observed. Given the diversity of ratios or percentage changes that can be used to represent swelling, it is critical to clearly express what type of swelling ratio is being reported in any case. All of these expressions have clear uses and relevance in different applications, and all are routinely reported in the literature. Note that any of these expressions may be applied equally to equilibrium swelling responses or non-equilibrium swelling responses. Swelling in hydrogels can be reasonably predicted in most cases by the Flory-Huggins model, first proposed by Flory in 1953 . This model describes the balance of osmotic contributions to gel swelling via the thermodynamic affinity of the gel building blocks for water (Πm, Eq. 5), the elasticity of the crosslinks in the network that resist a swelling or deswelling event (Πe, Eq. 6), and (for gels containing charges only) the Donnan equilibrium describing the role of counterion partitioning (and, due to water associations with those counterions, the additional osmotic gradient developed as a result of those counterions) within the hydrogel in driving gel swelling (Πd, Eq. 7). Here, k is the Boltzmann constant, T is the temperature (K), a is the characteristic length of the gel (m), φ is the volume fraction of polymer in the gel at the tested condition, φo is the volume fraction of polymer in the gel at the zero-strain state, χ is the Flory-Huggins solvent interaction parameter, Nx is the number of monomeric repeat units between crosslinking points, and f is the number of charged sites between crosslinking points. The polymer volume fraction at the new equilibrium state is defined as the value that drives the sum of all osmotic pressures influencing gel swelling to zero (Eq. 8). For typical swelling measurements, the zero strain state is assumed to be equivalent to the polymer volume fraction during gel preparation, given that crosslinks should form in a manner to minimize the free energy (and thus strain) in the system. However, in other cases in which swelling changes between two different equilibrium swelling states are sought, the zero strain state may be taken as the initial equilibrium polymer volume fraction. The a term can be simply defined in spherical micro/nanogel systems as the particle radius but can also be estimated for any shape of hydrogel in terms of the characteristic length and the ratio between the total volume and surface area of a gel of any shape/dimension. The mixing term Πm incorporates both enthalpic (i.e., polar interactions between the polymer and water) and entropic (i.e., entropy gains by allowing lattice sites to be occupied by polymer or solvent) terms and may contribute to either swelling or deswelling depending on the value of the χ parameter, which is directly related to the polymer solubility parameters of the gel building blocks. Similarly, the elastic term Πe may promote swelling if the other terms promote gel contraction (reducing entropy versus the zero strain state via chain compression/coiling) or deswelling if the other terms promote gel expansion (reducing entropy versus the zero strain state in terms of chain stretching). The Donnan term Πd can only drive swelling due to the increased water content required to maintain high entropy of counterions to fixed charges on the gel network (if any). More complex models can incorporate other effects on gel swelling, including chain stiffness (suppressing swelling/deswelling) , co-ion effects and background electrolyte (reducing Donnan equilibrium-based swelling) , direct repulsion between polymer-bound charges (increasing charge-driven swelling) , and counterion condensation (decreasing charge-driven swelling, particularly at higher overall ionic strengths) . These more complex models have been applied to both bulk gels  and particulate gels with well-defined charge/crosslinker distributions . However, unless hydrogels are made with liquid crystal-like building blocks (chain stiffness effects), very high charge densities (direct repulsion), or measured at high salt concentrations (counterion condensation/background electrolyte effects), these additional contributions are typically not necessary to consider to generate reasonable swelling estimates. Swelling in bulk hydrogels can be measured in multiple ways. The most common, and simplest, method is to track the change in the dimension(s) of the hydrogel upon exposure to a new solvent, allowing for the calculation of the volume-based swelling ratio. Measurements are made simpler when the hydrogel is fabricated in a container (e.g., a glass capillary)  that restricts gel swelling in only one dimension, increasing the accuracy of the volume swelling measurement at the cost of slowing down the response time of the gel due to the lower interfacial exposure of the gel to the new solvent conditions. Note that this approach inherently assumes the hydrogel is isotropic (i.e., swelling occurs equally in all dimensions if not otherwise constricted). Alternately, gravimetry is also widely used to estimate mass-based swelling ratios by weighing the hydrogel before and after exposure to the new solvent conditions [17, 18]. The hydrogel is most commonly contained in a wire mesh , a dialysis bag , or a cell culture insert  to enable facile handling of the gel between weighing steps without the need for tweezers that may break or damage the hydrogel; the pre-weighed container mass is subtracted from the overall mass at each time point. Gentle wicking of surface (nonabsorbed) water is typically performed using Kimwipes prior to measurement to ensure all water mass measured is adsorbed or absorbed within the hydrogel. Less commonly, the swelling pressure can be measured by loading a hydrogel on a mechanical test frame and tracking the change in measured normal force as a function of swelling . Quantitative measurements of swelling using this method require the confinement of the gel to direct all swelling in the normal direction, as gel swelling in the lateral direction is not directly assessed using z-direction force measurements. As such, swelling pressure measurements are not routine and are typically used only in cases where the forces exerted by a swelling hydrogel are relevant to the target application. Microscale gel swelling can be measured using laser diffraction instruments that can probe particle sizes on the microscale . Alternately, optical microscopy can be used to track size changes visually, with particle size changes assessed using image analysis algorithms or software . In this latter case, care must be taken to ensure that an adequate number of representative particles (typically n > 100) is assessed to achieve statistically relevant particle size results. Swelling responses in nanogels can be tracked by any nanoparticle size measurement strategy, most commonly dynamic light scattering (DLS) . While DLS is a powerful technique that is highly accurate for monodisperse nanogel populations, the intensity-weighted nature of the default particle size distribution coupled with the significantly higher weightings of larger scattering entities in those distributions (according to Mie light scattering theory) can lead to inaccurate swelling ratio measurements for broad or polydisperse nanogel populations. Volume or number distributions can be calculated if the refractive index of the micro/nanogel particle is known; however, no current analytical technique is available for such measurements, although reasonable estimates can in some cases be achieved if the water content of the nanogel is known by calculating a weighted average of the polymer and water refractive indices. As an alternative, newer methods such as single nanoparticle tracking analysis (NTA)  or tunable resistive pulse sensing (TRPS)  can directly measure number distributions of particle sizes with single-particle accuracy, using light diffraction to track particle diffusion paths in the former and the Coulter principle to track the electrical resistance as nanogels flow through a stretched pore in the latter. 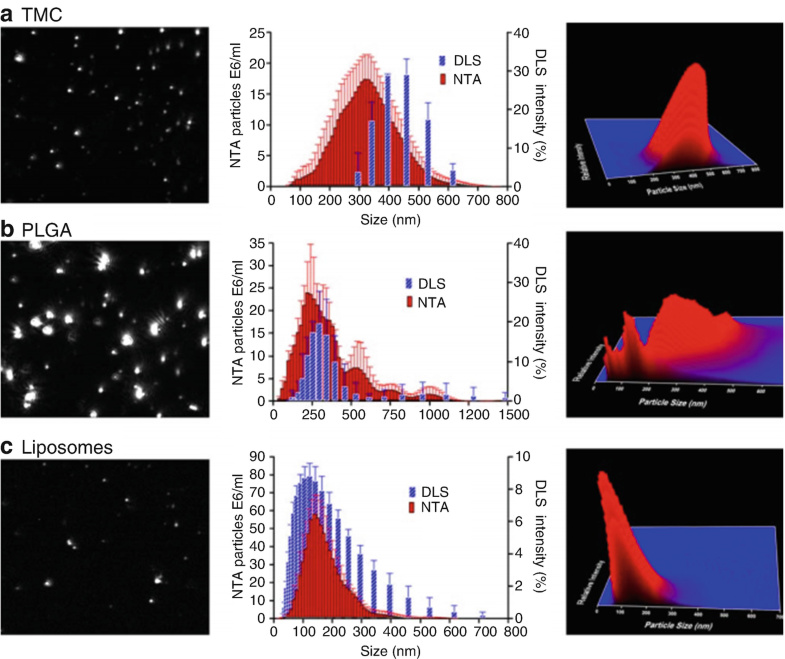 It is highly recommended for reliable swelling measurements of nanogels with broader particle size distributions to apply at least two of the available methods (DLS, NTA, TRPS) to ensure that accurate conclusions are drawn about the nanogel population; in particular NTA or TRPS will provide significantly better resolution of multiple nanogel populations whose modes are close together and/or very broad particle size distributions in which the higher size population will be much more intensively weighted by DLS analysis, while similar results are likely to be achieved with any method for more monodisperse nanogel populations (Fig. 2). The mechanical properties of hydrogels are determined primarily by the crosslink density of the hydrogel, although the inherent viscosity of the polymeric building blocks (related to their molecular weight and degree of hydration) and the rigidity of the bonding structure within each hydrogel building block also contribute to the overall mechanical properties. Assuming a Gaussian statistical distribution of crosslinker within the hydrogel, the crosslink density νe (representing the molar concentration of elastically effective strands) can be related to the stress/strain response of a hydrogel according to rubber elasticity theory (Eq. 9). Here, F is the force, A is the cross-sectional area of the unstrained hydrogel perpendicular to the direction of the applied force, R is the gas constant, T is the temperature, and λ is the extension ratio (i.e., the strain experienced by the sample). This correlation is most commonly used in practice by measuring a modulus (the ratio between stress = F/A and the strain λ) and converting the molar crosslinker concentration ve to a number concentration of crosslinks per unit volume using Avogadro’s number NA. Eq. 10 shows this correlation for the plateau shear elastic modulus in the linear viscoelastic regime G’p, although other moduli (tensile, compressive, etc.) could also be interpreted in a similar context . The number concentration of crosslinks ve can be converted to the number of monomeric units between crosslinks Nx (used in Eq. 11) based on a knowledge of the mass concentration of polymer per unit volume of the hydrogel, the average molecular weight of the monomeric repeat units Mo comprising the hydrogel, and the density of the hydrogel building block polymers ρ, as per Eq. 11. The estimates provided by simple rubber elasticity theory are only estimates, as any nonhomogeneity in the network can significantly alter the results. More complex models have been derived for some of these inhomogeneous network cases, although still assuming non-Gaussian statistical distributions of crosslinks and accounting for entanglement effects . For bulk hydrogels, mechanical properties in response to tensile, compressive, shear, or torsional strains can all be measured using rheometers or mechanical test frames with appropriate sample geometries and experimental assemblies. The type of mechanical test to be performed depends primarily on the anticipated nature of the mechanical stresses in the targeted application of the hydrogel being studied, although some practical limitations are also inherent in choosing measurement approaches. Given the low kPa range of most hydrogel moduli, standard rheometers are most commonly used for analysis and can accurately measure both compressive (normal force measurements as a function of head displacement) and shear (oscillatory force measurements as a function of frequency) moduli. As with any oscillatory rheology experiment, a stress or strain sweep should first be conducted at an intermediate frequency to first identify the linear viscoelastic range of the hydrogel being tested; the following frequency sweep should be conducted at a stress/strain value within this range to ensure that the storage (G′) and loss (G″) shear moduli are calculated based on the correct assumptions. The use of mechanical test frames for both compressive and tensile testing is also possible, albeit with two limitations: (1) the load cell must be sufficiently sensitive to detect the low stresses resulting in most cases from hydrogel strain and (2) for tensile testing, a method must be identified to assemble a hydrogel sample with the appropriate geometry that can be clamped to the test frame. In this latter case, stiffer hydrogels can easily be molded and clamped using conventional techniques; however, weaker hydrogels must be measured using alternative clamping or immobilization techniques such as wirelike “rakes” that puncture the hydrogel at multiple places (Fig. 3a) . Other methods such as gravity-induced bending or pressure-based bulging perpendicular to a gel cylinder , magnetic spherical ball inclusion (measuring displacement as a function of magnetic force applied to the entrapped magnetic ball) , deflection of silicone cantilevers during gel compaction , and indentation (measuring the force required to insert a spherically tipped indenter in a defined distance into the hydrogel)  have also been reported as alternative methods for measuring hydrogel mechanics (Fig. 3b–c), albeit with limitations in some cases for weaker gels (indentation) and in other cases for stronger gels (magnetic inclusion, gravity/bulge displacement). While all the above strategies effectively probe the average moduli of a bulk hydrogel, an interesting alternative approach called cavitation rheometry has also been developed to measure local moduli within bulk hydrogels . In this approach, a capillary or needle is inserted locally within a hydrogel sample and air is injected at a controlled rate. The corresponding pressure as a function of the air volume is tracked until the critical pressure of mechanical instability is reached, a pressure that can subsequently be correlated to the modulus of the material. This technique uniquely allows for multipoint modulus measurements within the hydrogel and can be performed using inexpensive instrumentation. 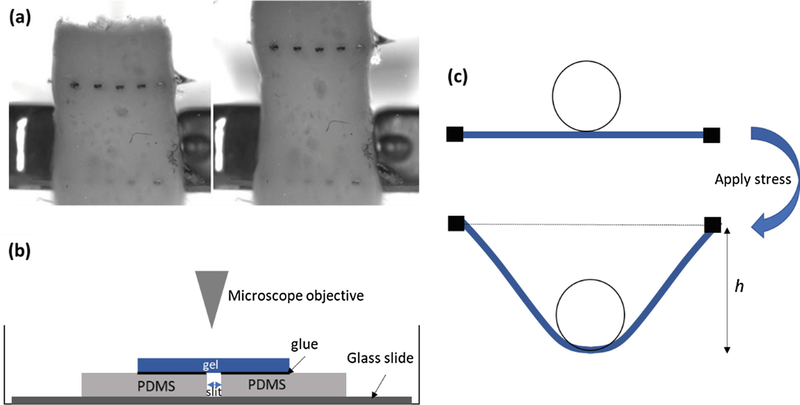 For microscale hydrogels, cantilever-based systems coupled with a microscope are available for performing compressive testing of single gel microspheres, with a capacity to perform measurements on microparticle-based hydrogels as small as 20–30 μm in diameter . Micropipette aspiration measurements have also been developed in which the gel microparticle is aspirated into a capillary tube and the modulus is calculated based on either the percentage of the material sucked into the tube at a particular applied negative pressure and/or the angle of deformation at the tip-sphere interface . Multisphere indentations coupled with Johnson-Kendall-Roberts (JKR) soft adhesion theory  and ultrasonic pulse-echo methods  have been reported as alternative strategies for gel microparticle modulus measurements. For nanoscale hydrogels, atomic force microscopy (AFM) is the only viable technique for measuring a modulus via an indentation/compression mechanism . Since this technique practically requires the adsorption or at least tethering of the nanogels to a substrate, care must be taken to ensure minimization of the known “pancaking” of nanogels upon interaction with surfaces that would complicate the conversion of the measured forces to moduli values. The gelation point for step-growth hydrogels can be predicted analytically based on the Carothers equation, which relates the fractional monomer conversion p to the gelation point π according to the average number of reactive functional groups on the monomer units favg (Eq. 12). Here, pgel is the fractional monomer conversion at the gel point π and Ni is the number of monomers with a functionality of fi (note that at least one monomer must have an fi greater than two in order to induce gelation). An analogous approach could be used to predict gelation conversions of pre-functionalized polymers that crosslink via a step-growth approach, with the average number of functional groups per precursor polymer chain used as the functionality of the “monomer” units in Eq. 12. In this context, the kinetics of the functional group reaction driving crosslink formation determine the rate of gelation. Note that an analogous gelation point calculation for chain-growth hydrogels is not physically meaningful since crosslinks are formed simultaneous to chain formation depending on the statistical incorporation of the crosslinking or backbone monomer(s) during the polymerization process, as determined by the copolymerization kinetics of the monomer(s) relative to the crosslinker(s). The gelation time can be experimentally determined using a vial inversion test, in which a vial containing the pre-gel components is rotated at pre-determined time intervals until no flow is observed during the defined measurement time . Alternately, shear rheology experiments can be conducted to track G′ and G″ as a function of time, with the time at which G’ = G″ (or G′/G″ = 1, conventionally defined as the gel point) corresponding to the gelation time of the hydrogel [40, 41]. The simplest approach for estimating the average pore size of a hydrogel is to use the Nx (number of monomer residues between crosslinks) value estimated via the swelling measurements (Eqs. 5, 6, 7, and 8) together with the known lengths/angles/numbers of bonds along the polymer backbone within each monomeric unit (calculated based on standard bond lengths/angles) to calculate an average separation distance between crosslinking points; the result corresponds to the (square) dimensions of a pore in a perfect mesh with a defined crosslink density ve with fully extended polymer chains. A somewhat more accurate estimate can be achieved by including the Flory characteristic ratio Cn, the ratio between the mean squared unperturbed end-to-end distance for a real chain <r2>o, to the value expected for a freely jointed chain with the same number of bonds of the same mean square length (Nxl, where l represents the length of the individual monomer units along the polymer backbone) to compensate for the non-idealities of real polymer chains. Equation 13 can subsequently be used to estimate the mesh size ε, which corresponds to the average pore size within the hydrogel . However, such an approach ignores the substantial heterogeneities that are present in most hydrogel samples and are essential to understand, demanding the development of experimental techniques to gain an improved understanding over internal network structure. Scanning electron microscopy (SEM) is the most common method used in the literature to assess hydrogel morphology, although transmission electron microscopy (TEM) is also frequently used to probe nanogel structures [43, 44, 45]. The obvious limitation of the technique in the context of hydrogel analysis is that it must be conducted under vacuum and thus requires removal of the water phase from the hydrogel prior to imaging. This is typically done either via a lyophilization process (i.e., quick-freezing the sample in liquid nitrogen or dry ice and then sublimating the water under reduced pressure)  or via a solvent exchange process followed by critical point drying (i.e., stepwise replacement of water with an organic solvent prior to drying) [47, 48]. Both these methods are inherently problematic. During lyophilization, free water inside hydrogels can form organized ice crystal structures upon quick-freezing that deform the gel and, following removal of the ice via lyophilization, leave behind macropores that are then imaged. Indeed, it is these micro/macropores resulting from ice crystal growth that are most commonly observed in SEM hydrogel images in the literature and are often highly misleading relative to the actual swollen state of an unperturbed gel, although it should be acknowledged that a correlation does exist between the size of the ice crystallites and the modulus of the hydrogel (i.e., stiffer gels result in smaller ice crystallites forming) . The size of such ice crystals can be suppressed by improving control over the freezing process [50, 51]. Solvent exchange/critical point drying avoids these problems but introduces other challenges in terms of correlating the swelling state of the hydrogel in the exchanged organic solvent relative to that observed in water. Performing smaller gradient solvent steps helps to preserve the aqueous structure of the hydrogel  but is not a complete solution. Cryo-EM approaches can offer somewhat improved images by avoiding the need to remove solvent, as imaging is performed on a substrate maintained at low temperature typically using liquid ethane . However, crystallite formation upon freezing can still deform the native microstructure to some degree, particularly in weaker hydrogels, and the resolution (absent the use of reconstruction algorithms) can still be limited. As such, while SEM/TEM has some degree of utility in terms of analyzing hydrogel morphology, results only from SEM/TEM must be interpreted judiciously in light of the sample preparation techniques required. The uptake (or exclusion) of molecular or nanoparticle-based probes with well-defined hydrodynamic diameters into hydrogels can be used as an indirect strategy to characterize the pore size distribution. Analogous to the molecular weight cutoff of a membrane, macromolecules or nanoparticles with diameters larger than the maximum pore size of the hydrogel will be fully excluded from the gel phase, while probes of sizes smaller than the maximum pore size will be able to penetrate into the hydrogel to a degree proportional to the percentage of hydrogel pores equal to or larger than the size of the probe used. The most common probes used include fluorescein-labeled dextrans, which are commercially available in a range of molecular weights from ~4 kDa up to 2 MDa  (albeit with somewhat different polydispersities which must be considered in interpreting the data). Proteins are also highly useful as probes given their very well-defined geometries and molecular weights, eliminating any complications associated with the polydispersity of polymer probes. For example, using a set of fluorescently labeled proteins including bovine catalase (~240 kDa), glyceraldehyde 3-phosphate dehydrogenase (~146 kDa), avidin (68 kDa), trypsinogen (24 kDa), and myoglobin (17 kDa) allows for probing of pore sizes from the ~2 to 10 nm size range most typical of hydrogels, as successfully demonstrated on both bulk hydrogels and gel micro/nanoparticles [55, 56]. DNA can also be used as a probe given the precise control possible over the number of base units, often coupled with gel electrophoresis to accelerate the measurement . Well-defined nanoparticles or microparticles are also useful as probes for analyzing larger pore sizes in hydrogels, as previously demonstrated for natural mucin . It should be noted that this technique inherently assumes that the probe(s) can freely move through the gel micro/nanostructure without significant entrapment or adsorption. Given the noted capacity of proteins in particular to adsorb to interfaces, care should be taken to first understand any non-specific interactions that may occur to a substantial enough degree to interfere with the pore size measurements before quantitative pore size distributions are estimated from the data. As an alternative to tracking the physical size of the pores, NMR approaches can be used to instead investigate the dynamics and diffusion of water within hydrogel networks to gain insight into gel porosity based on the distribution of local confinements of water molecules by the network structure. The technique is based on the observation that the relaxation of bound water and free water within the gel is significantly different; as such, as more water is bound (i.e., more of the water in the hydrogel is adjacent to the gel building blocks, correlated to smaller pores), the overall relaxation rate accelerates . Two general approaches can be used. 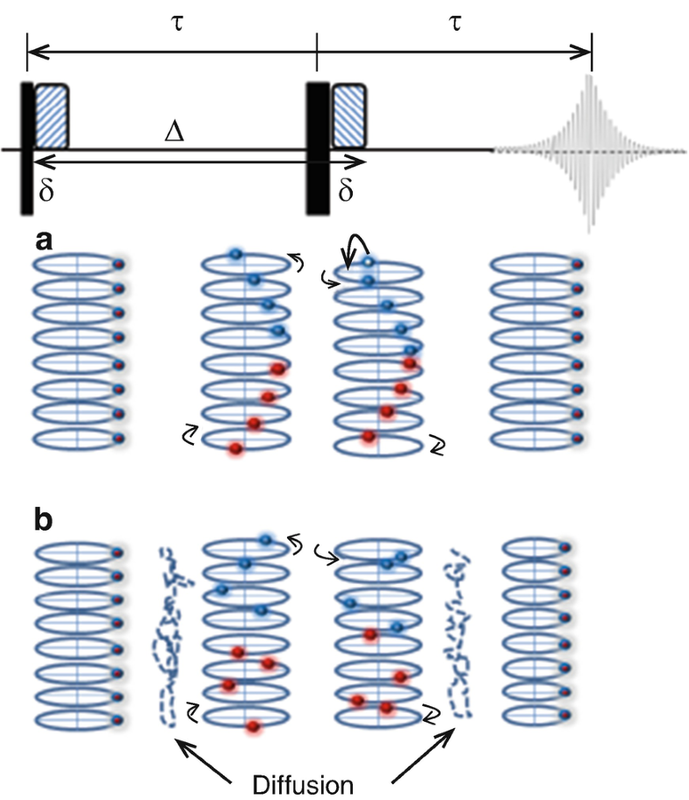 First, a spin-echo pulse sequence can be used to measure the longitudinal (T1) and transverse (T2) relaxation times of water within the hydrogel network. The resulting timescales of relaxation can be correlated with the self-diffusion coefficient of water based on the solvent viscosity and the size of the relaxing unit (i.e., water) . Second, the attenuation of a spin-echo signal by the dephasing of nuclear spins due to both translational motion of the spinning nuclei and the application of well-defined gradient pulses (pulsed gradient spin-echo NMR, or PGSE-NMR) can be used to measure an apparent water diffusion coefficient that can again be correlated to the gel pore size. PGSE-NMR measurements are advantageous in that they allow for measurements of translational diffusion on longer timescales (i.e., ms-s compared to ps-ns for simple spin-echo experiments) and do not require making any assumptions about the mechanism of relaxation (Fig. 4). However, since water molecules interact with several nearest neighbors (i.e., both other water molecules and the gel) over the time frame of the measurement, it cannot be used to give explicit self-diffusion coefficients . These strategies have both been widely used to estimate pore sizes in bulk [62, 63] and micro/nanoparticulate hydrogels [64, 65]. However, it should be emphasized that these methods explicitly allow only for the extraction of an average pore size, although some degree of insight into pore size distribution can still be attained. Furthermore, extracting an average pore size using either of these techniques requires extensive model fitting that is valid only if the key assumptions made to develop those models hold during the experiment. SANS has been widely used for the study of the internal morphology of hydrogels on multiple length scales. Neutron scattering is uniquely capable of probing the hydrogel-relevant length scale (<100 nm, or even up to <500 nm with ultra-small-angle neutron scattering); is sensitive to C, H, and O commonly found in the building blocks of most hydrogels; can generate high scattering contrast by simply swelling gels in deuterium oxide (D2O) instead of H2O; and can examine bulk samples given the highly penetrative nature of neutrons . Furthermore, unique to the other methods described above, SANS can simultaneously probe both the mesh size and the nature (i.e., average size and average spacing) of inhomogeneities within gel networks, which naturally occur in hydrogel systems due to the random inhomogeneity of the crosslinking process being locked into the resulting gel network. While these inhomogeneities are not typically detected in the zero-strain state during gel preparation, they become more significant when the gel swells (Fig. 5), creating static inhomogeneities within the network that significantly affect gel mechanics, transparency, and diffusion properties. These static inhomogeneities, coupled with the dynamic network fluctuations related primarily to temperature variations, provide information on gel structure on multiple length scales using a single SANS experiment. SANS experiments generate radially symmetric scattering profiles that are converted to plots of scattering intensity I(q) as a function of the scattering vector q = 4π sin(θ)/λ, where θ is the angle between the incident neutron beam and the detector and λ is the wavelength of neutrons (typically between 6 and 10 Ǻ). The resulting profile is then fit to appropriate scattering functions that allow for the extraction of microstructural information. Most scattering functions have the general form given in Eq. 14. Here, P(x) is the form factor related to the scattering due to individual features and S(q) is the structure factor related to the scattering from the inter-feature interactions or proximity between features (i.e., the sum of the dynamic mass fluctuations within the hydrogel network G(q) and the static/frozen inhomogeneities C(q) locked into the network via the inhomogeneous crosslinking process). Different hydrogels will require different structure factors to fit depending on their internal morphologies, with different information related to each morphology capable of being extracted. One of the more typical scattering expressions used to describe hydrogel morphologies is shown in Eq. 15 . In this model, the two key hydrogel parameters extracted are the correlation length ε between the static inhomogeneities and the characteristic size of the inhomogeneities Ξ, parameters that give insight into both the size (Ξ) and spacing (ε) of inhomogeneous features in hydrogels (note that both numerators are intensity-related weighting constants to facilitate fitting of the function to real scattering curves). Other functions including Porod, Lorentzian, and Guinier (some of which can be used to extract a correlation length that approximates the mesh size of the hydrogel as defined in Eq. 13) can also be used , with multiple static inhomogeneity terms added in some cases to account for the multiple types of inhomogeneities present in some gels . Contrast matching experiments are also possible in which one of the hydrogel components is deuterated. By adjusting the ratio between D2O and H2O in the solvent used to swell the hydrogels, the scattering between the solvent and protonated component(s) and the deuterated component(s) can be manipulated to effectively suppress signal from one or the other component by matching the scattering length densities of the solvent with that of the polymer phase desired to be hidden . This is analogous to observations with light, as zero net scattering is observed when a polymer phase and the solvent have equal refractive indices. The scattering length density is a direct function of the elemental composition of the hydrogel components, such that if the composition of the hydrogel is known, the H2O:D2O solvent ratio facilitating index matching can be reasonably calculated. Such analysis allows for investigation of the internal distribution of one gel component without interference from other components of the gel, another unique feature of SANS analysis of hydrogels. However, it should be noted that the information gained from SANS is highly model-dependent and requires both choosing the right physical model for the system and performing accurate fits to that model. In addition, highly specialized instrumentation is required to perform the experiments, requiring a neutron source with a sufficient flux and appropriate wavelength to probe the desired length scales of hydrogel features. The transparency of hydrogels is critical for the use of hydrogels for optical applications. Transparency can be simply measured using UV/vis absorbance/transmittance measurements, with the threshold for transparency depending on the thickness of the hydrogel used and the needs of the specific application . Refractive index measurements can also be performed, although the high water content of most hydrogels results in refractive index readings rarely far from those of water ; this is true even in hydrogels that are visually opaque due to the formation of internal scattering domains. 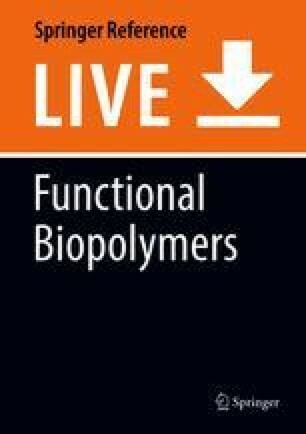 While a comprehensive coverage of biological assays associated with the use of hydrogels as biomaterials is outside the scope of this chapter, the reader is referred to the excellent recent review on the use of hydrogels for cell culture applications from Burdick’s group for guidance on best practices for culturing cells on (2D) or inside (3D) hydrogels and assessing the capacity of those cells to remain viable, proliferate, grow, migrate, or differentiate . Protein adsorption to hydrogels is also of interest to measure, as the high hydrophilicity of hydrogels is often useful for suppressing non-specific protein adsorption and, subsequently, the inflammatory response following implantation in vivo [74, 75, 76]. Fluorescent  or radioactive probe  labeling of model proteins or of complex protein mixtures (e.g., whole blood or blood plasma) is typically used to enable detection of the fraction of added protein that binds to a hydrogel. Interpretation of the results of a protein adsorption experiment is however sometimes challenging with hydrogels given that proteins may both adsorb (as with conventional hard biomaterials) and absorb (due to the internal porosity) in hydrogels, depending on the size of the proteins relative to the hydrogel pore size; indeed, proteins are used as probes of gel porosity due to this capacity for non-specific absorption into the gel phase. 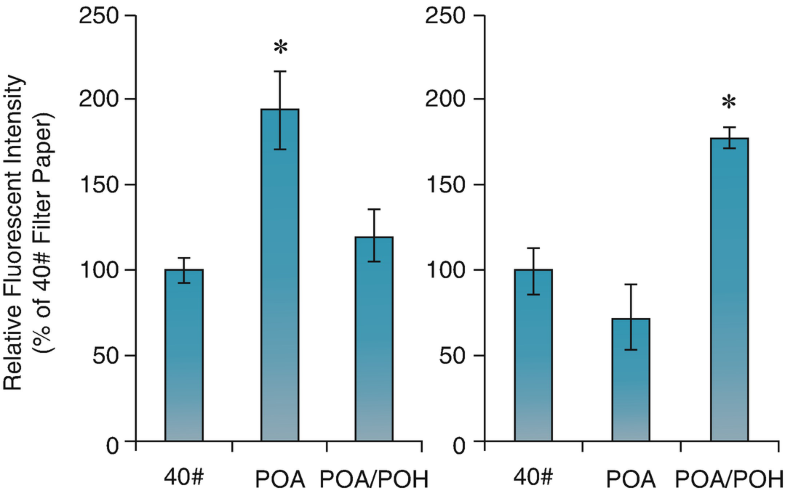 As such, a hydrogel with smaller pores may be noted to exhibit less overall protein binding but actually interfacially adsorb more protein, likely to ultimately result in a more severe inflammatory reaction. Confocal imaging of fluorescently labeled protein distributions across a hydrogel cross-section can assist in differentiating these contributions and improve the prediction of the potential compatibility of a hydrogel in a biological application . The characterization of hydrogels is inherently more challenging than with many other materials given the dynamic nature of hydrogels as their environment (solvent type, humidity, etc.) changes. Indeed, many of the core techniques used to characterize in particular the chemistry of “hard” polymer materials (e.g., XPS, NMR) are at best challenging to apply to quantitative hydrogel characterization. There are significant needs (and thus opportunities) to develop improved techniques for (a) performing traditional characterization techniques accurately on hydrogels (e.g., developing new NMR pulse sequences) and/or (b) developing strategies of drying hydrogels (e.g., critical point drying) that minimally perturb the swollen structure of the hydrogel in water. 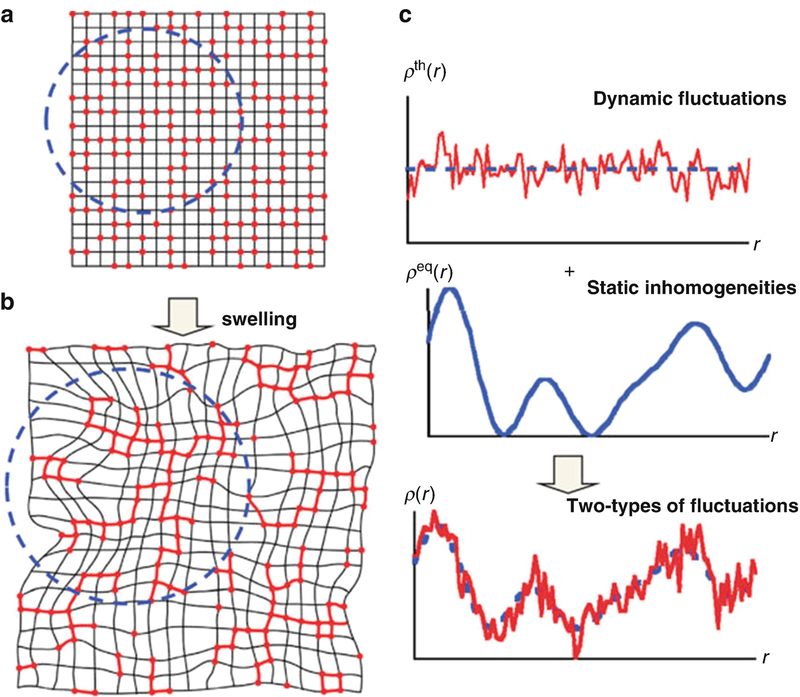 However, significant recent advancements have been made in the context of accurately measuring the mechanics of hydrogels under various stress regimes using a variety of creative techniques. The continued development of such techniques is expected to yield further insight into the fundamental properties and physics of hydrogels, enabling improved engineering of hydrogel structures to achieve targeted hydrogel performance.